PROJECT SUMMARY: This property is located in the Armfield Neighborhood of Summerfield, NC where there are no ambien or street lights leaving this home overly dark. Architectural & security lighting were very important to the homeowners and extra attention was placed in this lighting design to provide a safe and serene environment and home. LOCATION: The lighting designs and installation for this project can be found in the Armfield Neighborhood of Summerfield, NC 27358. LIGHTING DESIGN: Ideal landscape lighting should evoke Safety. Security. SERENITY and should always start with a design. The correct amount of light was important for this canvas. The right fixture, the right wattage, and the right beam angle were important to highlight the correct features and provide a safe environment without overwhelming the space. Southern lights focus was first placed on the architectural & security lighting. Many of the homes near and beside them were already lit, leaving them feeling like they were living in a black hole. Extra attention was placed in making sure that the homes landscape lighting enhanced the safety of the property, but did so in a soothing, natural way. This home could have been illuminated with flood lights and provided security lighting, but the effect would have been harsh, unattractive, prison yard lighting. Not to mention the electric bill would be increased dramatically using line voltage(120v) instead of (12v) low voltage lighting. The walkway leading to the front door was also an area where Southern Lights wanted to increase visibility for guests. Utilizing path lights along the front walk provided some very nice “pools of light”. We used the same path light at the front entrance of the driveway where brick culvert walls anchored both sides. These homeowners were concerned that they and there guests might drive off the driveway if adequate lighting wasn’t available in this area. HURDLES TO OVERCOME: Designing an ideal landscape lighting system takes planning. Getting light to the right place to properly illuminate the front elevation of the homes architecture proved some skill and time were needed to coordinate installing wire to the desired fixture location with the use of gutter mounted fixtures. Homeowners have a driveway that is curved at the front entrance and felt the need for some additional light so that drivers would see the edge of the driveway and the beginning of the bed. 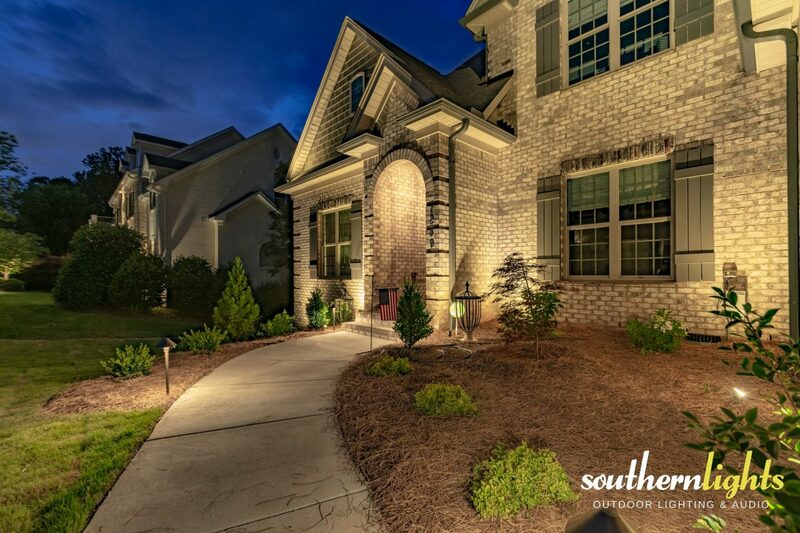 Worried that area light or path lights may become damaged by vehicles, Southern Lights chose to place them next to the brick wall which added some additional security fo the fixture, but also highlighted the wall and landscape. This client ultimately trusted Southern Lights with the lighting designs allowing us to provide the the most ideal landscape lighting effects with the best lighting fixtures for the space and structures. We think it turned out pretty awesome!